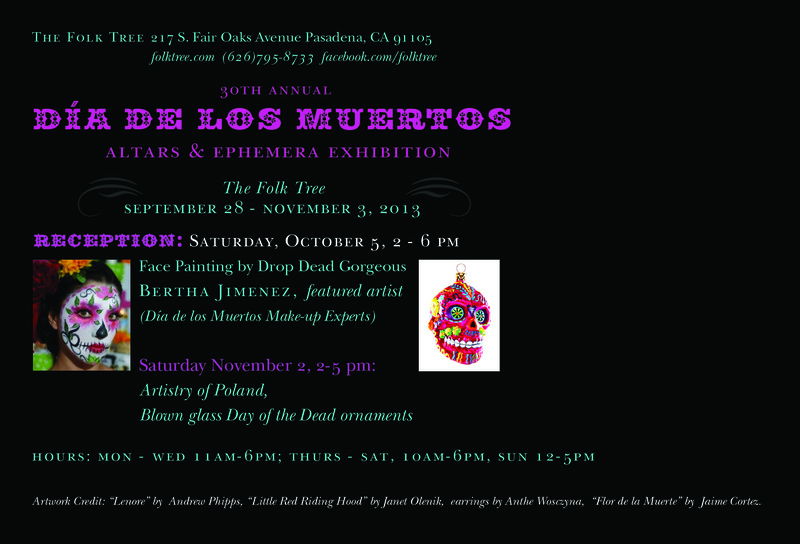 The Folk Tree does Dia De Los Muertos right, and it’s been doing it for a long time under the curatorial stewardship of Gail Mishkin. The list of artists is long and good. Happily, I am one of them. The show is chock full of artwork–everything from jewelry, to papier-mache sculptures to floor-to-ceiling themed altars. Try to make it to the reception to capture the full festive atmosphere with food and music. We love The Folk Tree! The best showcase of quality dia de los muertos curious and ofrendas in the entire Los Angeles area, including Olvera Street (Which is saying something!). I’ll be showing here this year, as well. Definitely worth a stop-over for anybody who’s looking for an essential holiday experience.